Installation view “Atsuko Tanaka: The Art of Connecting,” © Ryoji Ito, Photo ART iT. The most comprehensive survey of works by Atsuko Tanaka to date, MOT’s “The Art of Connecting” is part of an international collaboration with Ikon Gallery in Birmingham and the Espai d’art contemporani de Castelló, both of which hosted the exhibition in mid-to-late 2011. Presenting original works together with archival materials and film footage, the exhibition makes the case for Tanaka as a seminal figure in postwar Japanese art, not only as a member of the historic Gutai group of artists, but also for the singular vision and approach to materials she displayed throughout her career. This is evident from the earliest works on display, a group of “Calendar Collages” (c 1954) made first with miscellaneous pieces of paper ranging from blueprint to an international bill of lading before shifting to a more severe treatment of numbers sketched onto fabric that has been ripped apart and then glued back together. Also included are two iconic pieces: the sound installation Work (Bell) (1955/2000), a string of bells extending across two galleries and activated into clamorous life by the push of a button; and the Electric Dress (1956) made of colored, exposed light bulbs of various shapes and sizes that have been strung together in a flashing burka-like full-body garment. Lesser known, but no less impressive, is the 16mm film Round on Sand, shot in 1968 in collaboration with the photographer Hiroshi Fukuzawa, which some viewers may remember from the Gutai film archive presentation at the 2008 Yokohama Triennale. 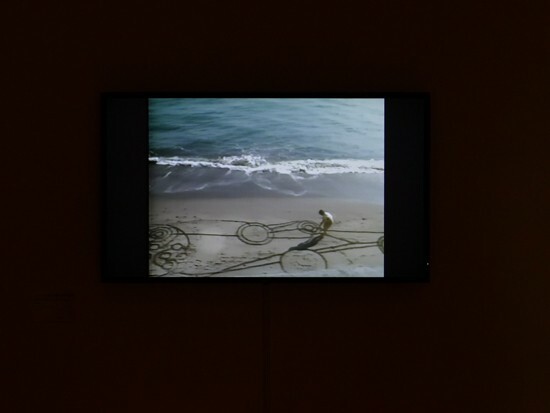 Presented here on a monitor, the film finds Tanaka spending a day at the beach, using first chalk and then the end of a pick axe to mark the pier and sand with the circuitry of curvilinear and concentric patterning that became her trademark, and seemingly evolved from the group of drawings and sketches titled “Drawing after Electric Dress” (1956). 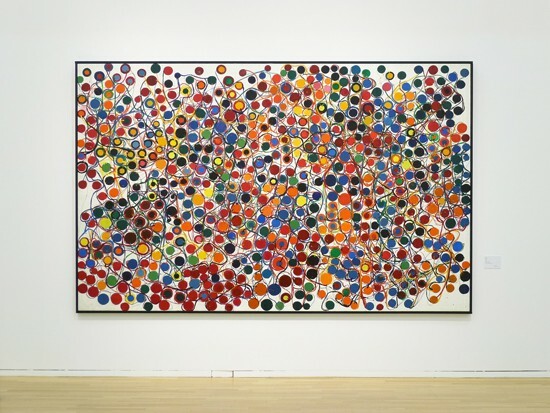 Concluding with a gallery of paintings spanning the years 1957 to 2004, the exhibition roughly charts three distinct phases, or episodes, in Tanaka’s career, from diverse experimentation to the development of a visual language and then the refinement of that language over time. But it also suggests that Tanaka was an artist of such diverse talents – working with fabric and collage and performance and installation and drawing and painting – that she was able to fit multiple careers into one lifetime.